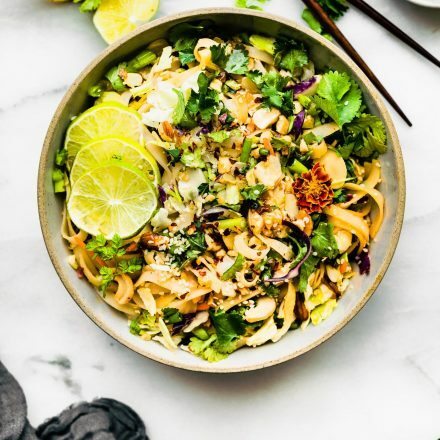 Thai Noodle Salad is a healthy rice noodle salad recipe that can be made two ways – with added protein, or as a meatless meal! 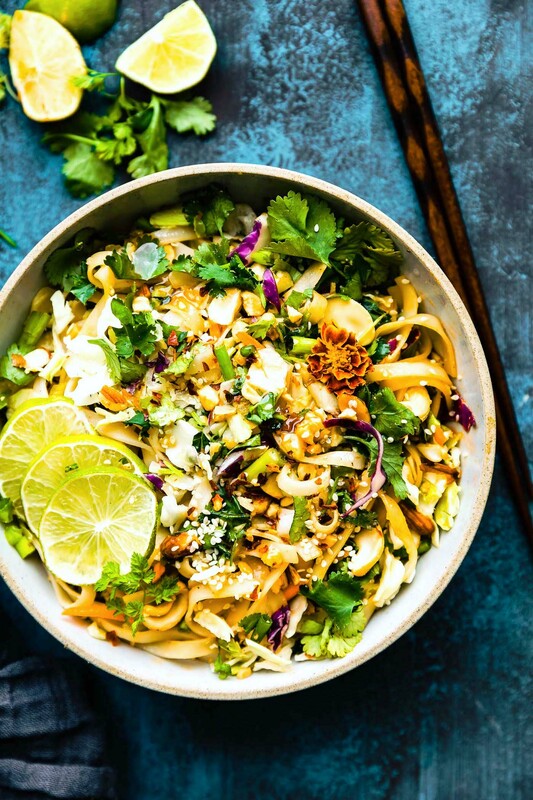 A gluten free Thai noodle salad is perfect for meal prep. 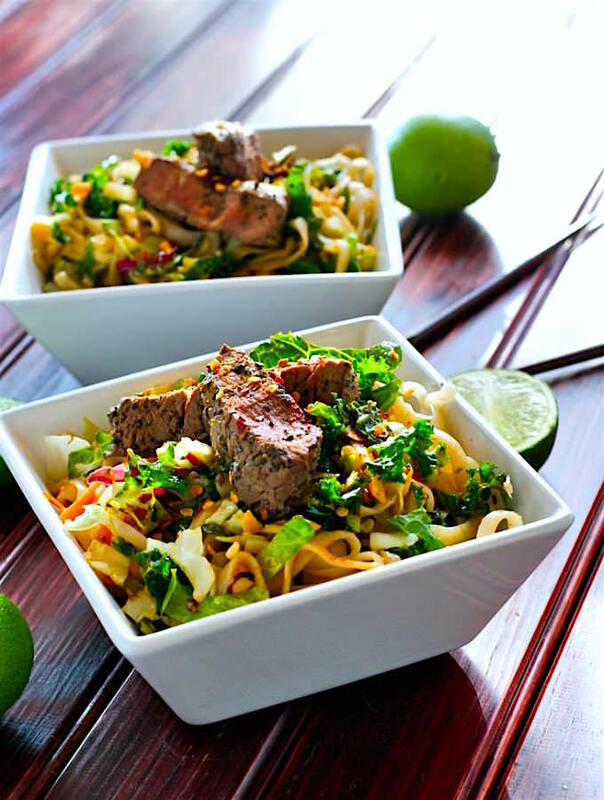 All you need is chopped cabbage, cilantro, peppers, rice noodles, lime, and an Thai style chili sauce to marinate them in! 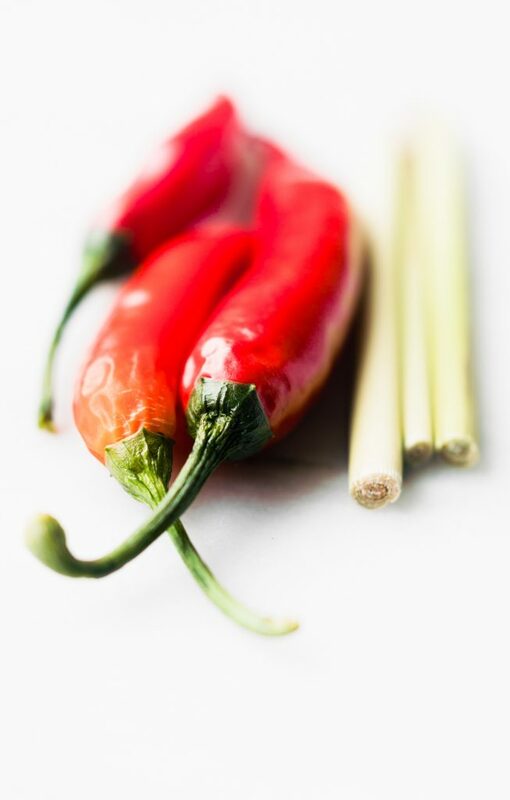 Bonus –> cold rice and rice noodles are great for your health; read more below! 2 things that are underappreciated. First, the EASE of this MEAL PREP recipe; seriously can’t go wrong with a crunchy spicy (yet cold) Rice Noodle Salad. It’s been 3 years since I have shared this thai salad recipe. That long, really? 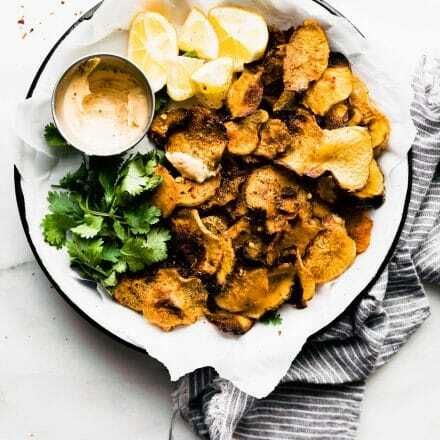 Gah, this is a fav SO we updated the photos and recipe for ya! Secondly, leftovers. Yes the deliciousness of these leftovers for weekday lunch plans makes me happy. There’s something about cold noodles that just makes me happy. Maybe it’s because I used to eat them before 6am volleyball practice during my high school years. Shh… don’t tell my mom, but that was me who always snagged the last bit of leftovers before the rest of my family did. Hey, can you blame me? I grew up with three older brothers, if you didn’t grab food when you could, you wouldn’t get any, especially NOODLES! You see, nowadays, things have changed. 10 years of eating gluten free! That means rice noodles, veggie noodles, and chickpea pasta are usually our go to for pasta dishes. Be that it is also end of summer, a cold rice noodle chopped salad with extra thai flavors and spices has become a staple! 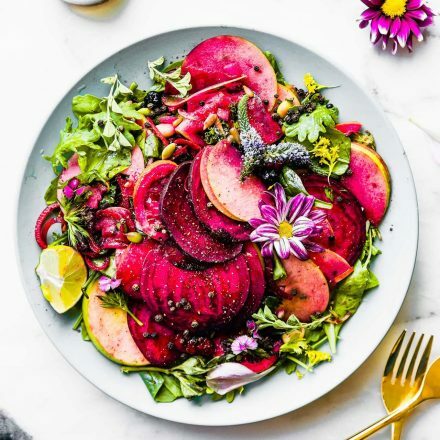 Yes, this salad is a must for those hot days! Especially when you’re training, extra active, or just always on the go! You (we) need those good nutrients and carbohydrates to refuel! Can you guess it? Yep –> it’s a resistant starch. Wait, hold up. I think I should probably go over this RS (resistant starch) thing again. What is it, why do we like eating it? LET THE NERDY NUTRITION TALK BEGIN! Sounds like a bad thing, right? Actually it’s not. It’s VERY GOOD thing! Resistant starch can actually HELP improve digestion! How? This type of starch provides more bacteria in the gut because it is resistant to breaking down into sugar/glucose. And new research has discovered that if you cook your rice or rice pasta in 1 tsp of coconut oil first, it actually increases the RS (resistant starch). So we did just that, a little experimenting with the cooling times too. We let the pasta sit overnight, which really helped with the soaking up the spices and flavor. Plus cooling it for 12 hours is the so called “peak time” for resistant starch. Once the rice noodle salad was cooled, we mixed it up two ways. One with crunchy chopped salad and cabbage, sliced thai peppers, thai chili sauce, and crushed nuts to keep it meatless and vegan. The other way I made this salad was by slightly sauteeing the chopped cabbage with sesame oil and a little bit of sweet asian chili sauce. Then I topped each noodle bowl with beef (for that extra protein and iron). It was a little less crunchy but also a little more fragrant! Both nutritious and delicious! The vegetarian option is perfect for that pre workout fuel! Haha carb load. Or wait till after your workout and eat the BEEFY salad for a healthy recovery meal! See, solving all your “what to eat when” problems here. 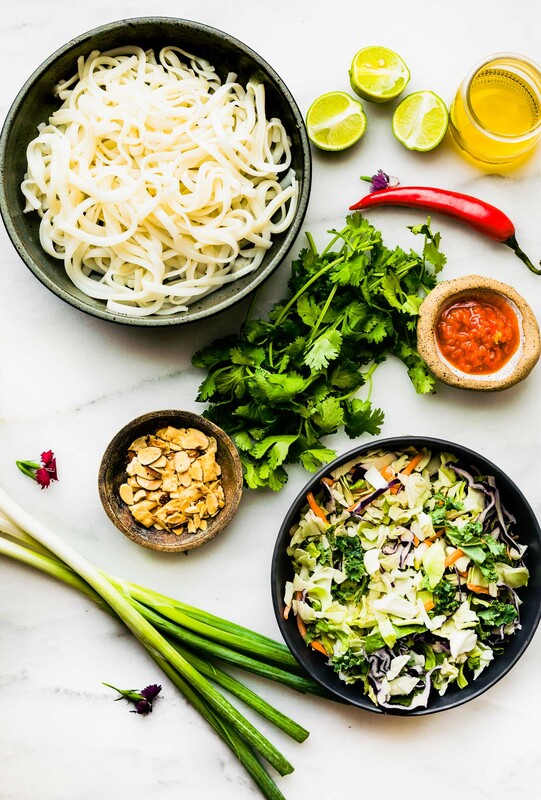 Spicy Thai Rice Noodle Salad – 2 Ways! This gluten free rice noodle salad is a healthy addition to any meal or you can make it a main meal by adding protein. Vegan option! First cook your rice noodles according to instructions. Usually takes around 8 minutes or less. Rinse in cold water. After the rice noodles are cooked, place them in a large bowl and add in 2 to 3 tsp sesame oil, pepper, salt, and asian chili sauce. Mix and place in fridge to cool. For best flavor and resistant starch, let it sit for at least an hour. After it’s cooled, toss your noodles with the rest of your ingredients. You can lightly saute or steam your cabbage salad first or leave it raw. Mix with you nuts, tamari sauce, onion, vinegar, and garlic. Add more pepper and sesame seed and/sesame oil if desired. Toss in bowl and squeeze fresh lime juice on top. Add red pepper flakes for extra spice! Chopped Cilantro to garnish. Serve or keep in fridge for when ready. If you want to make this dish a main meal, add 8 ounces of a cooked protein. Example; steak strips, chicken, shrimp, tofu, etc. Nutrition below is for the Thai Rice Noodle Salad one, no meat added. Protein options – cooked chicken, shrimp, beef, or even tempeh or tofu! Let’s recap, eat cold noodles all the livelong day and your gut will be happy! Just kidding. 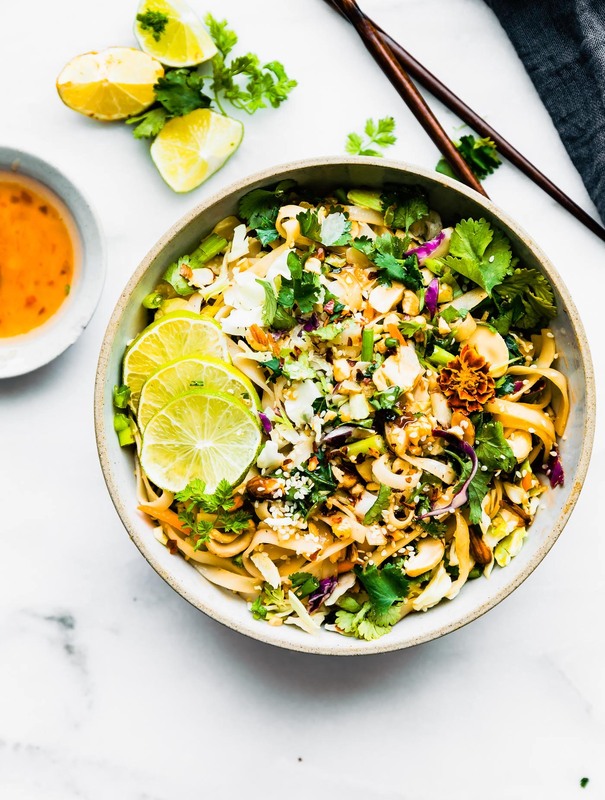 But now you know the GUT HEALTH reasons on why you should keep a big batch of cold rice noodles (or any other resistant starch recipe) in your fridge this summer. Oh and why cold leftovers are a blessing. Just sayin..
Dear rice noodle salad, you just so darn tasty. Who’s ready to start slurping? What’s your favorite cold pasta salad dish or noodle salad recipe? That looks so good and I never thought about eating Rice Noodles cold! I definitely need to get on that…..I still have a package in my pantry! I don’t like pasta salad, so what we are going to do is call this leftovers or just cold noodles and go from there, k? Rice noodles are my noodles of choice, and you know I love anything Asian and spicy. I must make this! I love cold noodles and don’t eat them nearly enough! This looks delicious. That looks so good. Where does one find rice noodles? I like cold noodles with veggies. This looks like a fantastic recipe! oh yes, we are so alike! cold everything! haha well not coffee. i don’t like iced coffee. gasp! oh my gosh, that sounds divine! can your mom come cook for me? LOL! Dang lady – I never fail to learn something new when I come visit (your blog)! I don’t like most pasta, but, I do like rice “ramen” noodles – I had no clue eating them cold and throwing in some coconut oil, could be so good for me! I really need to try doing this, soon! i can’t find rice ramen noodles, i will have to look for sure! Need this so bad- ove cold noodles and 2 days? Winning! You had me at spice! haha i know, i wait a lot for food anyway with a hungry husband. Delicious dish + science stuff…it makes the bio nerd in me love everything about this post! This looks fabulous!!! I’m drooling! 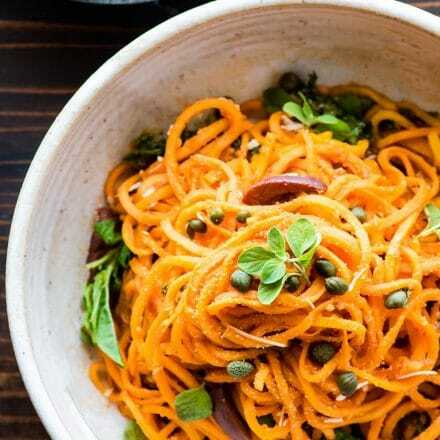 Cold noodles just scream SUMMER–this recipe looks so good woman! trade you for some toast? AVO ME! I’m not a pasta or noodle person, but I think you’ve convinced me to eat them! I’ve been craving Asian food for dayssssss. You just sent me over the edge. I’m with you on the nostalgia of cold noodles. It’s up there with cold pizza. Usually I prefer warm noodles/etc (probably because I’m constantly cold) but this recipe makes me want to give cold noodles a try! Especially because it has cabbage and grilled beef, which are two foods I’m really loving lately. mine too! the best hearty combo but still feels light! i love me some rice noodles. i haven’t made cold noodles in a while, but with this heat nothing sounds better. I am all over this! 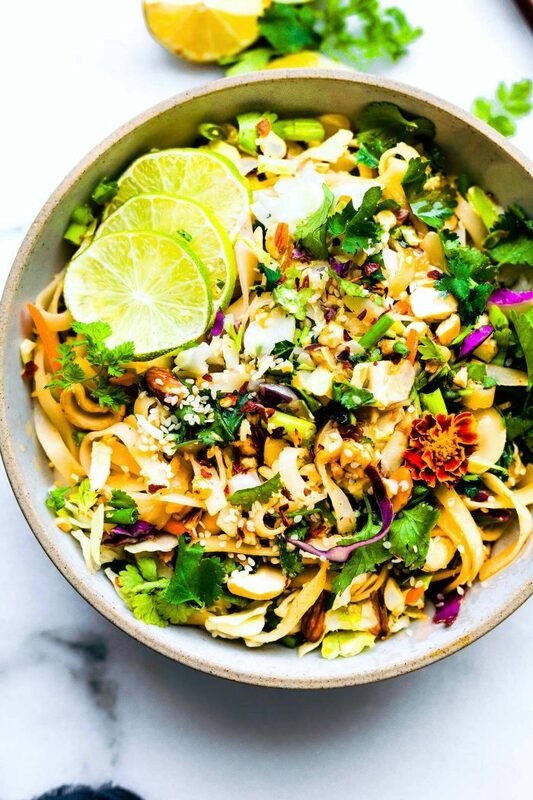 I love cold pad Thai salads in the summer and it has been on my list to make for a couple weeks now. I usually make a big batch to enjoy over a couple days and just haven’t found the time. Seriously why are there so many good eats and so little time?! 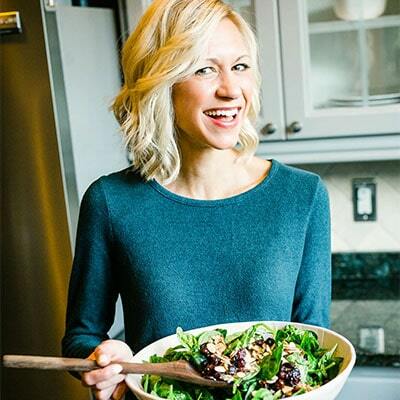 Not to mention my long list of ideas to make for blog eats…. I was hoping to tackle it this year. Haha! Seriously, when are you just going to come and cook for me all the time!?!! Well I for one appreciate the veggie heavy option. These pictures came out fantastic!! This looks absolutely incredible. You are just amazing! Yummy. I love rice noodles and spicy foods. Omg this looks amazing!!! Anything with noodles in it and I’m automatically in! you so should, it’s fab! This combines almost all of my favorite flavors, and I know it’s something my boyfriend would love too. That’s a win/win! oh yay! let me know if you try it Dani! This would be a totally different type of dish than I would normally make. This looks amazing. think they’d go for it? What a great dish for a delight summer dinner! We don’t add too much carbs to our dinner, and always prefer some protein and veggies. This is a perfect combination of everything we love! Not so heavy, just the right amount of everything we love, healthy and super delicious! we dont’ either, but we do use more carbs for after a long run/ride or workout. So these are awesome for lunch or post workout meal. Ya know? Love the cold noodles. haha. we’re weird. I’m glad you went over resistant starch again because I missed it previously and had no idea what it is or was, until now. Enlightening, thanks! Ooo this looks yummy as a summer meal outside on the patio 🙂 I like cold noodles, too! 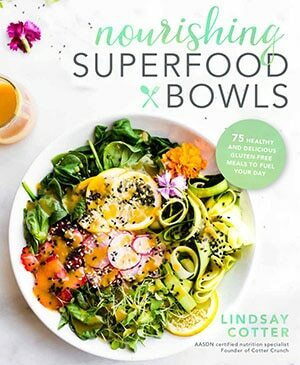 Awesome info and awesome recipes! We love cold noodles and these look sooo good! This looks SO GOOD!!! I love a good ole fashioned tuna macaroni salad – haven’t made it in years, but there is something so good about cold pasta salads. this looks phenomenal! oh i’ll come make it for you! p.s. how are you feeling? BRING IT ON! This is sensational Lindsay! Check out those noodles – love the spice, love the colour, love the photos, love everything about this and sharing, especially to the gluten free community! you bring your noodle dish and i’ll bring mine and we’ll have a noodle party! Hi, Lindsey. I just discovered your website through Maggie at the Omnivore’s Cookbook. I’ve been browsing and will make this recipe first. I never thought of cold rice noodles before. My question is regarding resistant starch with which I am not very familiar. You mentioned that if you cook your rice or rice pasta in 1 tsp of coconut oil first the RS will increase. What exactly do you mean by cooking and for how long? Can I use any other oil such as olive? One more general question: I believe that I ate gluten contaminated food last night and am incredibly sick today. Do you have a tip for what to do when this happens? Is there anything I can ingest to help my gut get over this? Thanks for the great site! Hi david! sorry about the gluten. I would try to eat lots of probiotic rich foods and limit grains for a few days. Load up on Vitamin C foods too. But keep things simple. 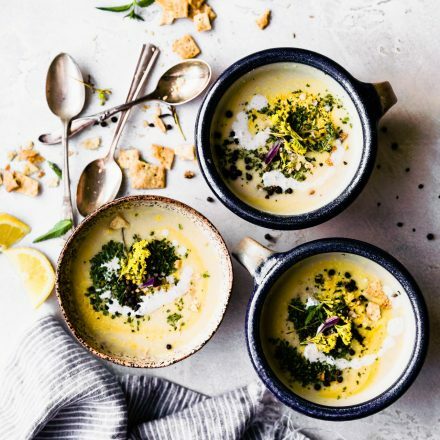 Soups might be best. As for the resistant starch, coconut oil is best due to it’s omega fatty acid chain. Just add in when you are cooking the rice. Or after once it’s cooked. either should work! Hope that helps. Oh my gosh, I’m so making this soon! I had something similar for lunch, and could honestly eat it everyday without tiring of it! Thai Salad Salad Thai dish you do very attractive. A vegetarian dish is quite attractive. I love Thai flavors and this is such a great salad to get them in! And in such a light and fresh way! Such a perfect way to cool off this summer! Woohoo! That is good to hear. Enjoy!